The EU at your fingertips! What are the EU Fact Checking and EU Fact Finding workshops? 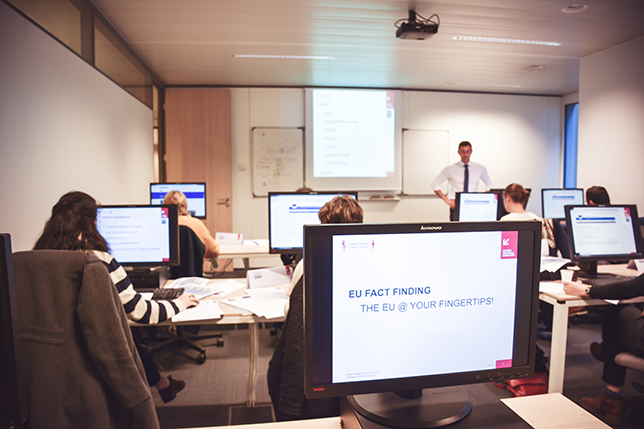 EU Fact Checking & EU Fact Finding are two focused half-day hands-on workshops in which participants learn how to find their way through the ‘jungle’ of EU-related websites and discover how to identify official vs unofficial and reliable vs unreliable EU information sources. An experienced trainer will guide them using interactive presentations made available to all participants during and after the workshop. The course has been organised since 2005 as part of the College of Europe executive training courses. The programme is particularly recommended for officials, lobbyists, consultants, translators, information and communication managers and other professionals with or without prior EU experience wishing to become more efficient in finding, discerning, and understanding information on the EU. Participants can decide to attend one or both workshops, benefiting from a discount on the final price when registering for both. Receive a certificate from the College of Europe upon successful completion. "The presentation is an excellent tool for my daily work. It will definitely help me finding information about the EU much quicker and in a more structured way." "The workshop was very helpful − especially with the resources that we can take home."